Hope's Cafe: Design-A-Mosaic Reveiw and Giveaway! Okay, this is a really neat company! 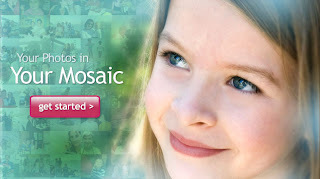 Design-A-Mosaic takes your photos, and turns them in to a beautiful mosaic picture for you. I was given the opportunity to "create" my own 16x20 photo mosaic. It's a very easy process-just upload your pictures (depending on the size of mosaic you order, you need between 20-3,000 pictures), pick a single picture to be your main image, and then Design-A-Mosaic does the rest! After a couple days they send you an email so you can check out how it looks, make sure it's how you want the design done, and then a week or so later...you'll receive your very own photo mosaic! On the larger mosaics, you can also choose whether you'd like photo paper or canvas. I was told the mosaic would look best with either a 1-2 subject photo or landscape photo as the main picture, so, after browsing through our pictures for a long time, I decided to do my mosaic with pictures from our trip out west. I loved all the gorgeous scenery in Utah and Colorado, and this was a beautiful way to remember the fun time we had. I was expecting the mosaic to look good, but, honestly, it exceeded my expectations! It is really beautiful! Here's a couple shots up close, so you can see the smaller pics that make up the big picture! I love that you can still see the small pictures, too. It is like having a photo album and a wall hanging at the same time! I can't wait to get this framed so I can hang it on my wall. The history of this company is interesting to read, too. "For Christmas of 2003, I created a photo mosaic and gave it to my parent's as a Christmas gift. They loved it, and proudly displayed it in our living room so that everyone that visited our house would see it. When people would see the photo mosaic, they would ask me where I got it. I would explain that I created the photo mosaic on my computer, and did not know of a place where they could order one. They would always look disappointed, and express something along the lines of "Oh.. I was hoping I could order one". After many requests from friends and family, Design A Mosaic was created in 2005 to produce stunning photo mosaics for our customers. Our state of the art photo mosaic process combines skilled photo mosaic artists and our sophisticated, cutting edge technology to create photo mosaics that are not only high quality, but also a great value. Customer satisfaction is extremely important to us and if you are not 100% satisfied with your photo mosaic we will be happy to give you a complete refund." Now the best part of this? Design-A-Mosaic is giving one of my readers their very own custom Photo Mosaic! It will be the same size I received for review, the 16x20 on photo paper! This giveaway ends Wednesday, July 7, 2010 at 11:59 p.m. Please leave a valid email address in each comment, as this is how the winner will be notified. Winner will have 48 hours to respond, or another winner will be chosen. Giveaway open to US residents only. Disclaimer: I was not monetarily compensated in any way for this review. I did receive product for the purpose of review. All thoughts and opinions are mine. All quotes taken from the Design A Mosaic website. i would love one for the family...maybe a vacation or something. This has to be one of the coolest things I have seen in a long time! I would get this for my husbands BDay! That is just a start. I want everyone to have one! I would definitely love to give one of these for a Christmas gift! I love to take photos and have thousands of pictures of my daughter already (and she is only 3)! Awesome giveaway! Thanks for opening my eyes to this site! I would give this mosaic to my sister. I would include pictures of my 2 nephews. I'd get this as a present for my friend's birthday. I love this! I think good occasions to give this to someone would be graduation (I just graduated college!) and birthdays!! I would love to do one for my anniversary. Lots of pictures of us over the years, especially our wedding pictures. This would be great as a birthday gift for my best friend. I entered the Chopping Blocks Cutting Board giveaway. I think this would make a great wedding gift! i entered the photacular giveaway. I would give this as an anniversary present...lots of memories to share. I think this would be great for a Christmas present! i would definitely consider getting one for my mom for Mother's Day! Great gift! I entered the Chopping Blocks giveaway! I entered the SmartLab Toy giveaway. I would want to do one for my father for when he gives me away at my wedding so that he would have a mosaic of all the pictures of me as I was growing up. I would probably pick anniversary.